It can be very tempting for a househusband to stick a child in front of the television and let Igglepiggle, Upsy Daisy and Makka Pakka act as babysitters. But whether it's In the Night Garden, the Tweenies or the Teletubbies that push the all the right buttons for a toddler, too much television has a downside. For a start, TV addicts tend not to do as well in school and lag behind light TV viewers when it comes to reading. 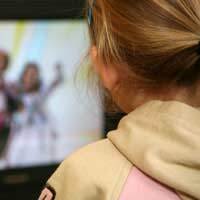 Infants who spend too long glued to the box may take longer than their peers to develop language skills, and too much television can dull the creativity and imagination of children. Heavy TV users are more reluctant to entertain themselves and will spend less time interacting with people and their environment. Communication between family members can suffer and, if feelings and opinions are not discussed, families can drift apart. The line between reality and fantasy is a little fuzzy for a child under seven, and TV violence can increase aggressive behaviour and make children less sensitive to the effects of violence. Graphic news reports of natural disasters or horrific accidents can instil a lot of fear and anxiety in a child. To top it all, children enter a trance-like state when watching television and their metabolic rate lowers, increasing the chance of obesity, raising cholesterol levels and reducing overall fitness. It's enough to make a stay-at-home dad give the TV remote control a quick blast in the food blender. There is no need for such a radical response, however. Instead, set a few TV rules and stick to them. For instance, children under 18 months can do without television, at 18 months half an hour a day is sufficient, and aged two this can increase to one hour per day. There is no need whatsoever for a toddler to have a television in their own room. Look for programmes that offer appealing characters, music and some educational value and avoid scary or violent programmes. Try to watch the TV programme with the child and encourage participation in the singing and dancing. Ask the child about what is going on during the show and try to stimulate learning. If the child is scared by anything on the television, talk about it, as a reassuring explanation can eliminate a lot of fear and confusion. It is far better for a child to consider television a form of entertainment rather than a reward for good behaviour, so do not use TV as a bribe or a privilege that can be taken away as a punishment. The TV is not there to comfort or cheer up the child either, so if the toddler is feeling low, rather than turning to the box, try to determine the cause and solve the problem. Most important of all, do not use the television as an electronic babysitter, as it will never listen to the child, respond to questions or deal with concerns. That's the job of the househusband.